Sweets Traditional rice cakes, tteok and Korean confectionery hangwa are eaten as treats during holidays and festivals. 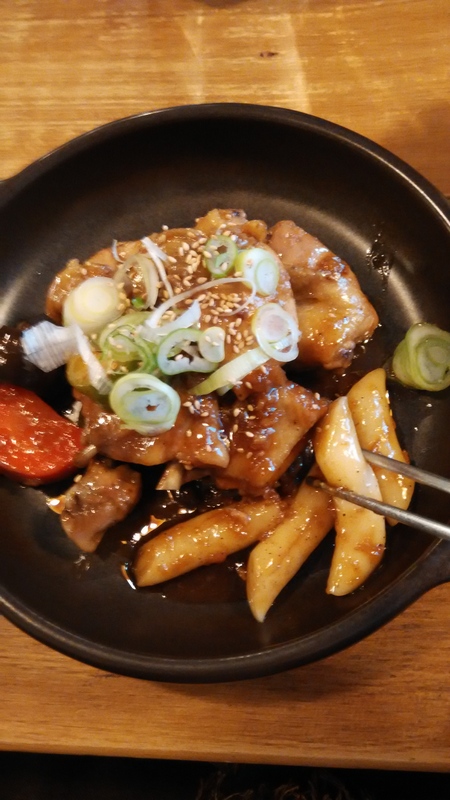 Tteok refers to all kinds of rice cakes made from either pounded rice (메떡, metteok), pounded glutinous rice (찰떡, chaltteok), or glutinous rice left whole, without pounding. It is served either filled or covered with sweetened mung bean paste, red bean paste, mashed red beans, raisins, a sweetened filling made with sesame seeds, sweet pumpkin, beans, jujubes, pine nuts or honey). 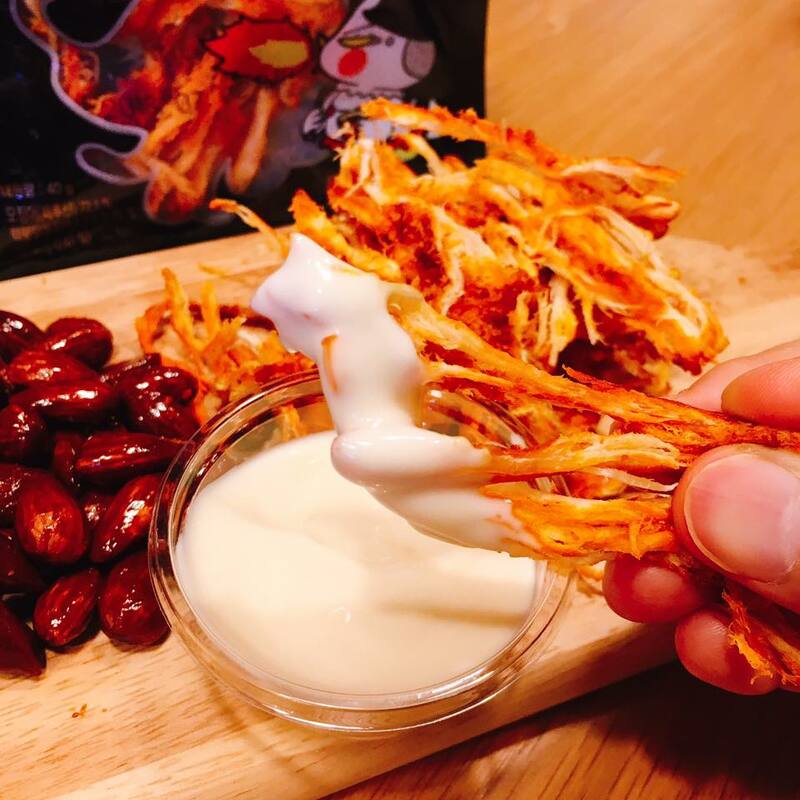 Tteok is usually served as dessert or as a snack. Among varieties, songpyeon is a chewy stuffed tteok served at Chuseok. Honey or another soft sweet material such as sweetened sesame or black beans are used as fillings. Pine needles can be used for imparting flavor during the steaming process. 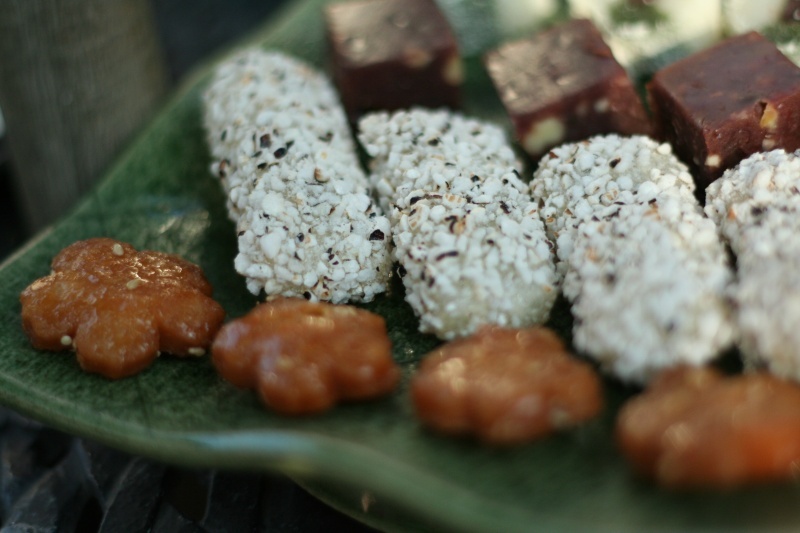 Yaksik is a sweet rice cake made with glutinous rice, chestnuts, pine nuts, jujubes, and other ingredients, while chapssaltteok is a tteok filled with sweet bean paste. 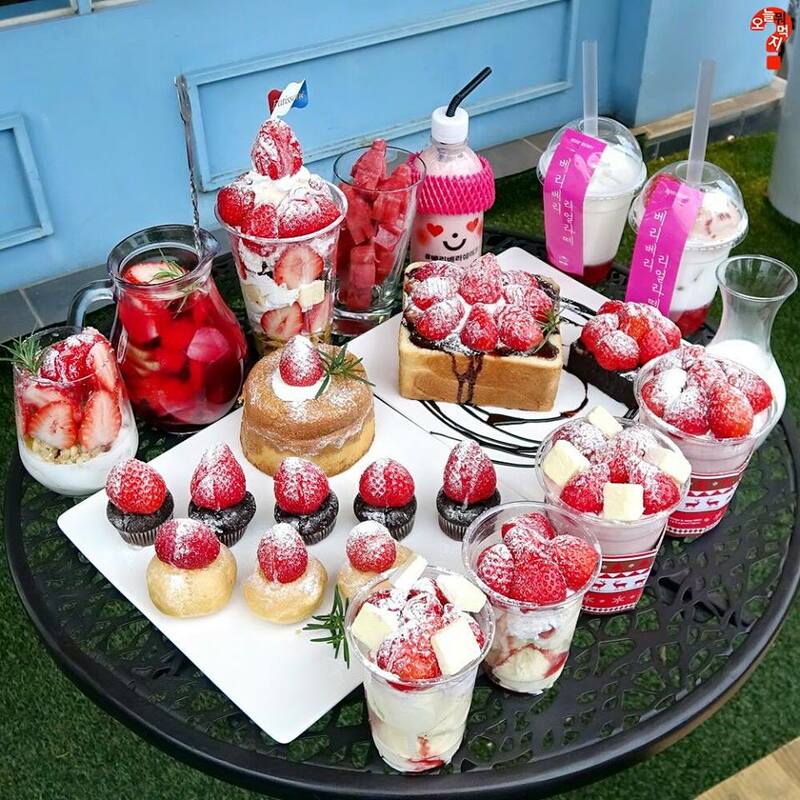 On the other hand, hangwa is a general term referring to all types of Korean traditional confectionery. The ingredients of hahngwa mainly consist of grain flour, honey, yeot, and sugar, or of fruit and edible roots. 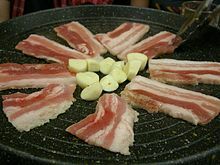 Hangwa is largely divided into yumilgwa (fried confectionery), suksilgwa, jeonggwa, gwapyeon, dasik (tea food) and yeot. Yumilgwa is made by stir frying or frying pieces of dough, such as maejakgwa and yakgwa. 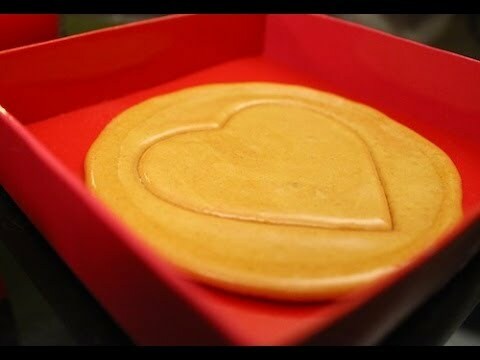 Maejakgwa is a ring-shaped confection made of wheat flour, vegetable oil, cinnamon, ginger juice, jocheong, and pine nuts, while yakgwa, literally "medicinal confectionery", is a flower-shaped biscuit made of honey, sesame oil and wheat flour. Suksilgwa is made by boiling fruits, ginger, or nuts in water, and then forming the mix into the original fruit's shape, or other shapes. Gwapyeon is a jelly-like confection made by boiling sour fruits, starch, and sugar. 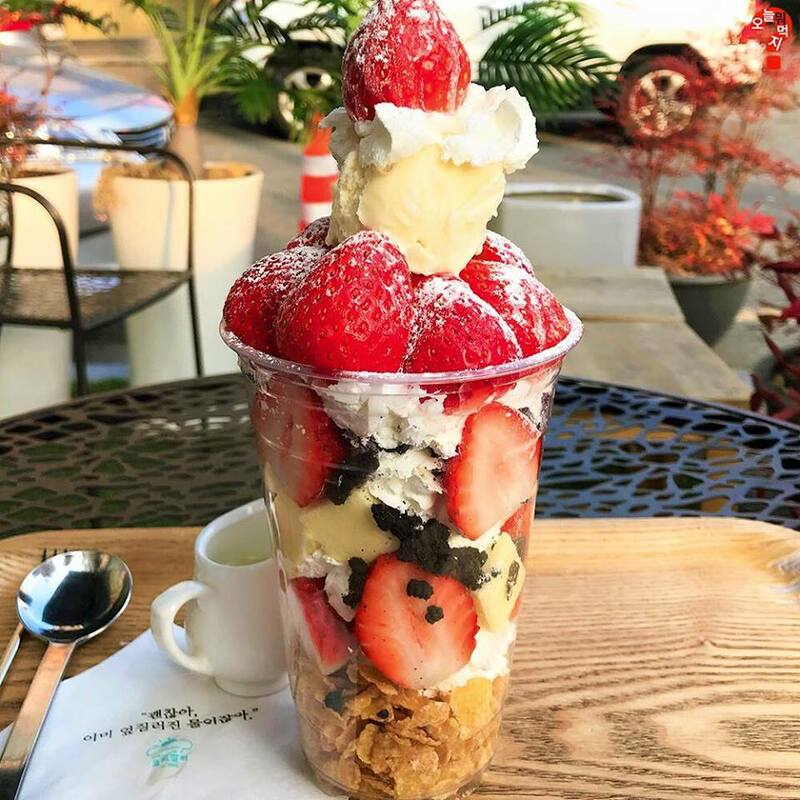 Dasik, literally "eatery for tea", is made by kneading rice flour, honey, and various types of flour from nuts, herbs, sesame, or jujubes. Jeonggwa, or jeongwa, is made by boiling fruits, plant roots and seeds in honey, mullyeot (물엿, liquid candy) or sugar. 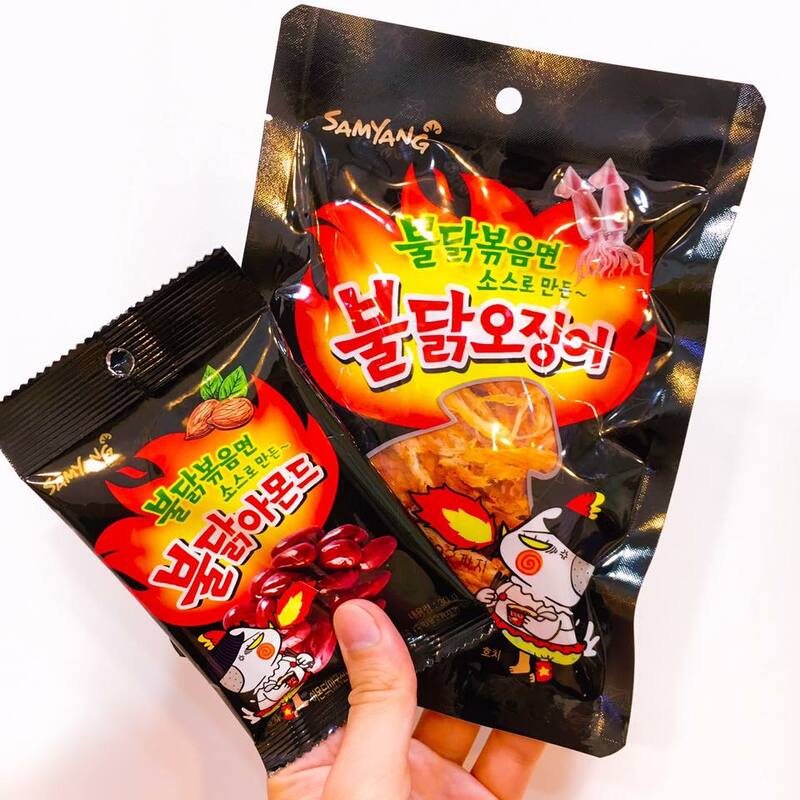 It is similar to marmalade or jam/jelly.Yeot is a Korean traditional candy in liquid or solid form made from steamed rice, glutinous rice, glutinous kaoliang, corn, sweet potatoes or mixed grains. The steamed ingredients are lightly fermented and boiled in a large pot called sot (솥) for a long time. Dining A single person bapsang(meal table). Each person was given a table in traditional dining setting. Korean chopsticks and spoon made of stainless steel. Dining etiquette in Korea can be traced back to the Confucian philosophies of the Joseon period. Guidebooks, such as Sasojeol (士小節, Elementary Etiquette for Scholar Families), written in 1775 by Yi Deokmu (이덕무; 李德懋), comment on the dining etiquette for the period. Suggestions include items such as "when you see a fat cow, goat, pig, or chicken, do not immediately speak of slaughtering, cooking or eating it", "when you are having a meal with others, do not speak of smelly or dirty things, such as boils or diarrhea," "when eating a meal, neither eat so slowly as to appear to be eating against your will nor so fast as if to be taking someone else's food. Do not throw chopsticks on the table. Spoons should not touch plates, making a clashing sound", amongst many other recommendations which emphasized proper table etiquette. The eldest male at the table was always served first, commonly served to them in the men's quarters by the women of the house. Women usually dined in a separate portion of the house after the men were served. The eldest men or women always ate before the younger family members. The meal was usually quiet, as conversation was discouraged during meals. In modern times, these rules have become lax, as families usually dine together now and use the time to converse. Of the remaining elements of this decorum, one is that the younger members of the table should not pick up their chopsticks or start eating before the elders of the table or guests and should not finish eating before the elders or guests finish eating. 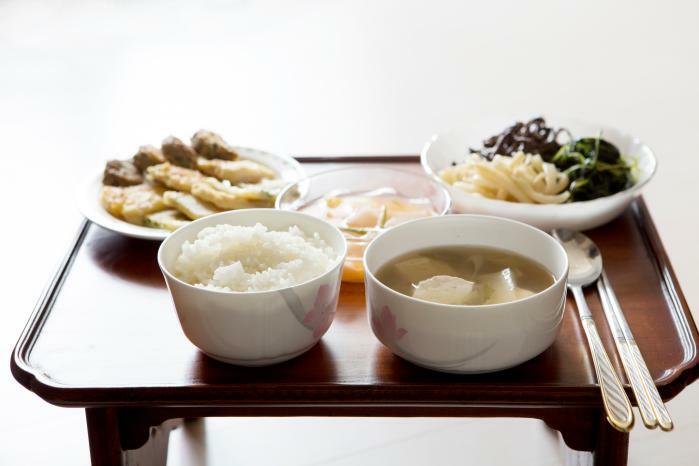 In Korea, unlike in China, Japan and Vietnam, the rice or soup bowl is not lifted from the table when eating from it. This is due to the fact that each diner is given a metal spoon along with the chopsticks known collectively as sujeo. The use of the spoon for eating rice and soups is expected. There are rules which reflect the decorum of sharing communal side dishes; rules include not picking through the dishes for certain items while leaving others, and the spoon used should be clean, because usually diners put their spoons in the same serving bowl on the table. Diners should also cover their mouths when using a toothpick after the meal. The table setup is important as well, and individual place settings, moving from the diner's left should be as follows: rice bowl, spoon, then chopsticks. Hot foods are set to the right side of the table, with the cold foods to the left. Soup must remain on the right side of the diner along with stews. Vegetables remain on the left along with the rice, and kimchi is set to the back while sauces remain in the front. Drinking The manner of drinking alcoholic drinks at dining is significant in Korean dining etiquette. Each diner is expected to face away from the eldest male and cover his mouth when drinking alcohol. According to Hyang Eum Ju Rye (향음주례; 鄕飮酒禮), the drinking etiquette established in Choseon Dynasty, it is impolite for a king and his vassal, a father and his son, or a teacher and his student to drink face to face. Also, a guest should not refuse the first drink offered by host, and in the most formal situations, the diner should politely refuse twice a drink offered by the eldest male or a host. When the host offers for the third time, then finally the guest can receive it. If the guest refuses three times, drink is not to be offered any more. 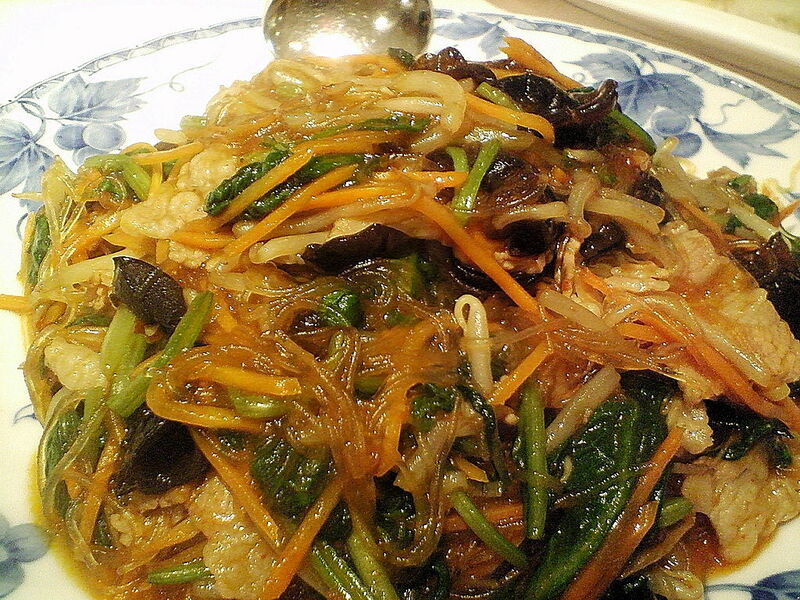 Noodles Japchae, a kind of Korean noodle dish made with marinated beef and vegetables in soy sauce and sesame oil. Main article: Korean noodles Noodles or noodle dishes in Korean cuisine are collectively referred to as guksu in native Korean or myeon in hanja. While noodles were eaten in Korea from ancient times, productions of wheat was less than other crops, so wheat noodles did not become a daily food until 1945. Wheat noodles (milguksu) were specialty foods for birthdays, weddings or auspicious occasions because the long and continued shape were thought to be associated with the bliss for longevity and long-lasting marriage. In Korean traditional noodle dishes are onmyeon or guksu jangguk (noodles with a hot clear broth), naengmyeon (cold buckwheat noodles), bibim guksu (cold noodle dish mixed with vegetables), kalguksu (knife-cut noodles), kongguksu (noodles with a cold soybean broth), japchae (cellophane noodles made from sweet potato with various vegetables) and others. In royal court, baekmyeon (literally "white noodles") consisting of buckwheat noodles and pheasant broth, was regarded as the top quality noodle dish. Naengmyeon with a cold soup mixed with dongchimi (watery radish kimchi) and beef brisket broth was eaten in court during summer. Jajangmyeon, a staple Koreanized Chinese noodle dish, is extremely popular in Korea as fast, take-out food. It is made with a black bean sauce usually fried with diced pork or seafood and a variety of vegetables, including zucchini and potatoes. It is popularly ordered and delivered, like Chinese take-out food in other parts of the world. Ramyeon refers to Korean instant noodles similar to ramen. Fish and seafood See also: List of Korean dishes § Fish-based dishes, and Jeotgal A bowl of gejang, marinated crabs in soy sauce and plates of various banchan (small side dishes) Fish and shellfish have been a major part of Korean cuisine because of the oceans bordering the peninsula. Evidence from the 12th century illustrates commoners consumed a diet mostly of fish and shellfish, such as shrimp, clams, oysters, abalone, and loach, while sheep and hogs were reserved for the upper class. Both fresh and saltwater fish are popular, and are served raw, grilled, broiled, dried or served in soups and stews. Common grilled fish include mackerel, hairtail, croaker and Pacific herring. Smaller fish, shrimp, squid, mollusks and countless other seafood can be salted and fermented as jeotgal. Fish can also be grilled either whole or in fillets as banchan. Fish is often dried naturally to prolong storing periods and enable shipping over long distances. Fish commonly dried include yellow corvina, anchovies (myeolchi) and croaker. Dried anchovies, along with kelp, form the basis of common soup stocks. Shellfish is widely eaten in all different types of preparation. 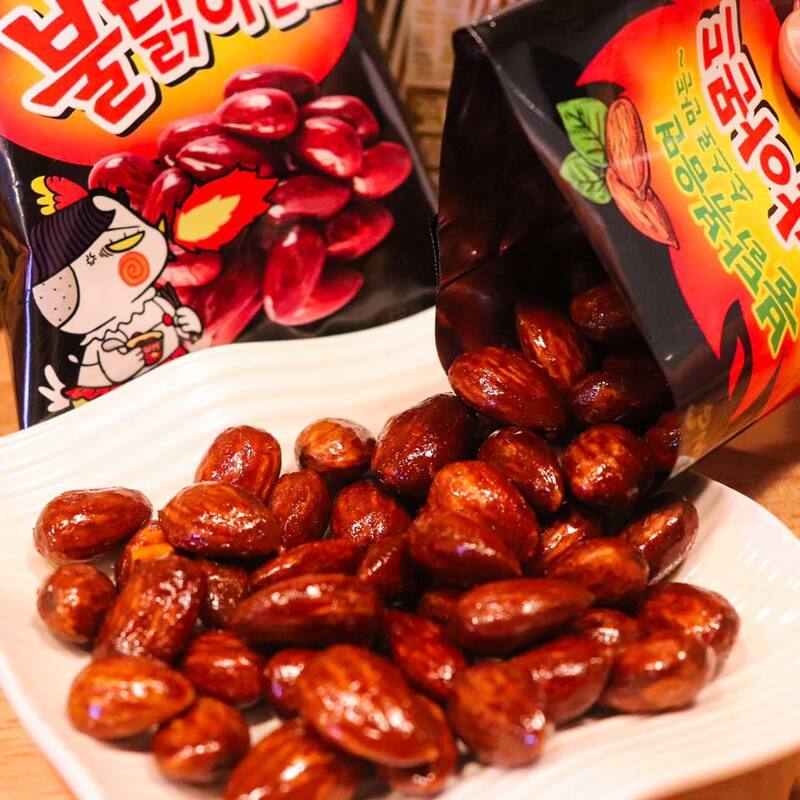 They can be used to prepare broth, eaten raw with chogochujang, which is a mixture of gochujang and vinegar, or used as a popular ingredient in countless dishes. Raw oysters and other seafood can be used in making kimchi to improve and vary the flavor. Salted baby shrimp are used as a seasoning agent, known as saeujeot, for the preparation of some types of kimchi. Large shrimp are often grilled as daeha gui (대하구이) or dried, mixed with vegetables and served with rice. 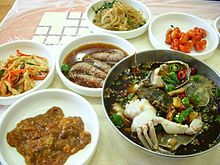 Mollusks eaten in Korean cuisine include octopus, cuttlefish, and squid. Vegetables Miyeok guk, a soup made from the sea seaweed, miyeok See also: List of Korean dishes § Vegetable-based dishes Korean cuisine uses a wide variety of vegetables, which are often served uncooked, either in salads or pickles, as well as cooked in various stews, stir-fried dishes, and other hot dishes. Commonly used vegetables include Korean radish, napa cabbage, cucumber, potato, sweet potato, spinach, bean sprouts, scallions, garlic, chili peppers, seaweed, zucchini, mushrooms and lotus root. Several types of wild greens, known collectively as chwinamul (such as Aster scaber), are a popular dish, and other wild vegetables such as bracken fern shoots (gosari) or Korean bellflower root (doraji) are also harvested and eaten in season. Medicinal herbs, such as ginseng, reishi, wolfberry, Codonopsis pilosula, and Angelica sinensis, are often used as ingredients in cooking, as in samgyetang. Medicinal foods Medicinal food (boyangshik) is a wide variety of specialty foods prepared and eaten for medicinal purposes, especially during the hottest 30-day period in the lunar calendar, called sambok. Hot foods consumed are believed to restore ki, as well as sexual and physical stamina lost in the summer heat. 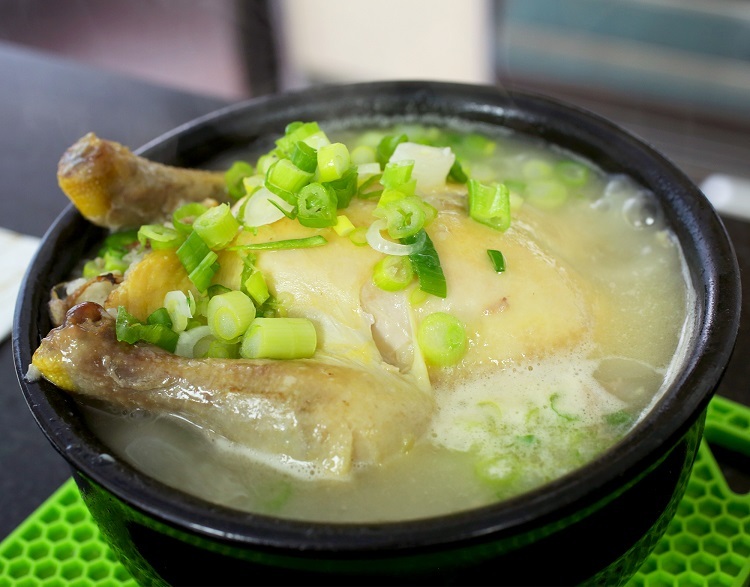 Commonly eaten boyangshik include ginseng, chicken, black goat, abalone, eel, carp, beef bone soups, pig kidneys. Grains See also: List of Korean dishes § Grain dishes Cooked rice sprinkled with four pieces of dried grape and cooked three chestnut in a black stone pot Dolsotbap, cooked rice in a stone pot (dolsot) Grains have been one of the most important staples of the Korean diet. Early myths of the foundations of various kingdoms in Korea center on grains. One foundation myth relates to Jumong, who received barley seeds from two doves sent by his mother after establishing the kingdom of Goguryeo. Yet another myth speaks of the three founding deities of Jeju Island, who were to be wed to the three princesses of Tamna; the deities brought seeds of five grains which were the first seeds planted, which in turn became the first instance of farming. During the pre-modern era, grains such as barley and millet were the main staples and were supplemented by wheat, sorghum, and buckwheat. Rice is not an indigenous crop to Korea, and millet was likely the preferred grain before rice was cultivated. Rice became the grain of choice during the Three Kingdoms period, particularly in the Silla and Baekje Kingdoms in the southern regions of the peninsula. Rice was such an important commodity in Silla that it was used to pay taxes. The Sino-Korean word for "tax" is a compound character that uses the character for the rice plant. The preference for rice escalated into the Joseon period, when new methods of cultivation and new varieties emerged that would help increase production. As rice was prohibitively expensive when it first came to Korea, the grain was likely mixed with other grains to "stretch" the rice; this is still done in dishes such as boribap (rice with barley) and kongbap (rice with beans). White rice, which is rice with the bran removed, has been the preferred form of rice since its introduction into the cuisine. The most traditional method of cooking the rice has been to cook it in an iron pot called a sot (솥) or musoe sot (무쇠솥). This method of rice cookery dates back to at least the Goryeo period, and these pots have even been found in tombs from the Silla period. The sot is still used today, much in the same manner as it was in the past centuries. Rice is used to make a number of items, outside of the traditional bowl of plain white rice. 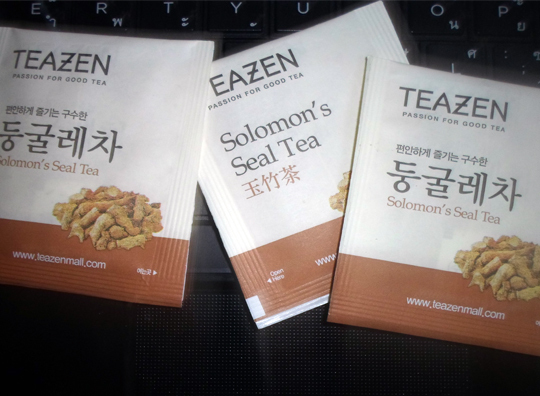 It is commonly ground into a flour and used to make rice cakes called tteok in over two hundred varieties. It is also cooked down into a congee (juk), or gruel (mieum) and mixed with other grains, meat, or seafood. Koreans also produce a number of rice wines, both in filtered and unfiltered versions. 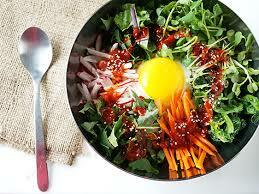 Korean cuisine Korean cuisine has evolved through centuries of social and political change. 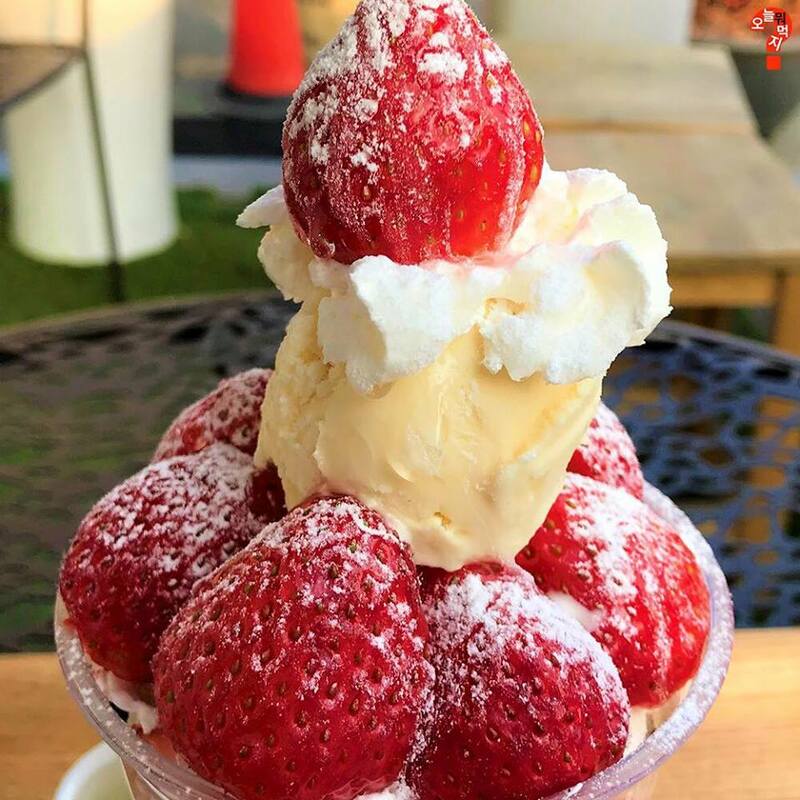 Originating from ancient agricultural and nomadic traditions in the Korean peninsula and southern Manchuria, Korean cuisine has evolved through a complex interaction of the natural environment and different cultural trends. 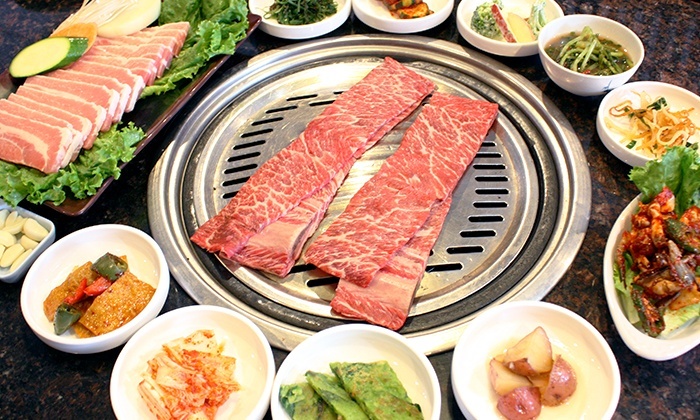 Korean cuisine is largely based on rice, vegetables, and meats. Traditional Korean meals are noted for the number of side dishes (반찬; banchan) that accompany steam-cooked short-grain rice. Kimchi is almost always served at every meal. Commonly used ingredients include sesame oil, doenjang (fermented bean paste), soy sauce, salt, garlic, ginger, pepper flakes, gochujang (fermented red chili paste) and napa cabbage. Ingredients and dishes vary by province. Many regional dishes have become national, and dishes that were once regional have proliferated in different variations across the country. 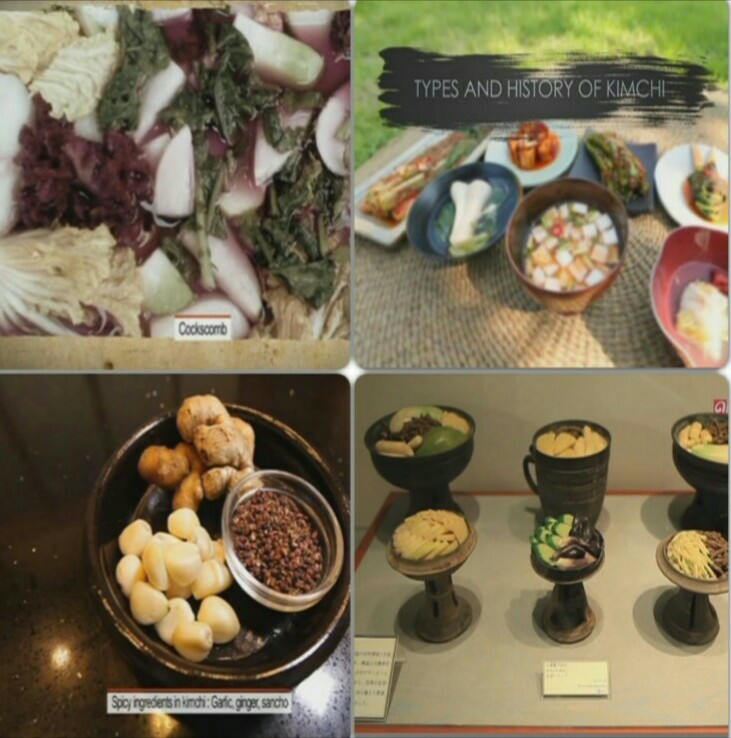 Korean royal court cuisine once brought all of the unique regional specialties together for the royal family. Foods are regulated by Korean cultural etiquette. I just went back from Korea and now I miss their foods!!! I found this video and wanted to share it because it's an easy recipe I myself have tried and really delicious, it's candy afterall. Korean's used to make them when they were poor because it's only based on sugar and baking soda and doesn't take long to do. Hello all. My name is ami from Indonesia. 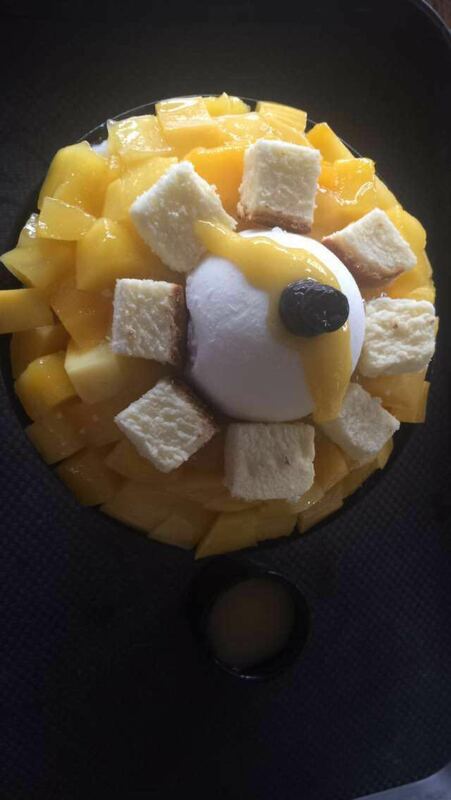 Last 2 days ago, I ate mango cheese patbingsu! It's delicious! 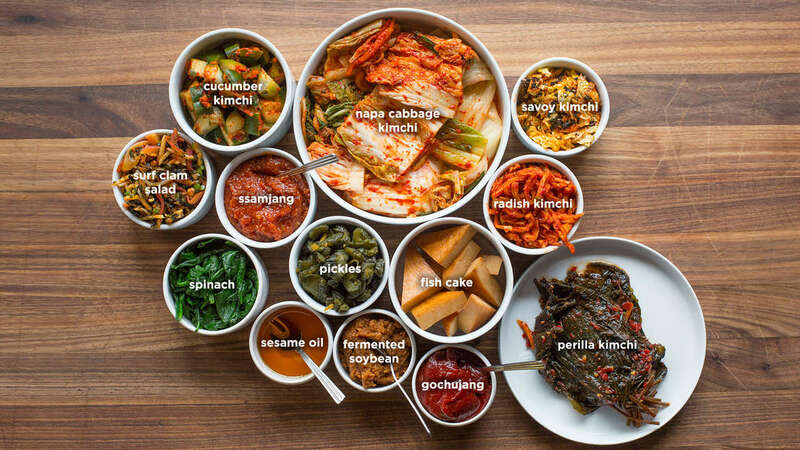 Kimchi comes in all forms and flavors. era(4th_7th centuries)/an era when three kingdom coexisted in one state. In this era they used seawater or salt water to pickle their vegetable. There was one chilli pepper that entered korea from Japan.....Now the red color of kimchi is because of this pepper. In the past Koreans used Cockscomb to give appetizing red color to kimchi.